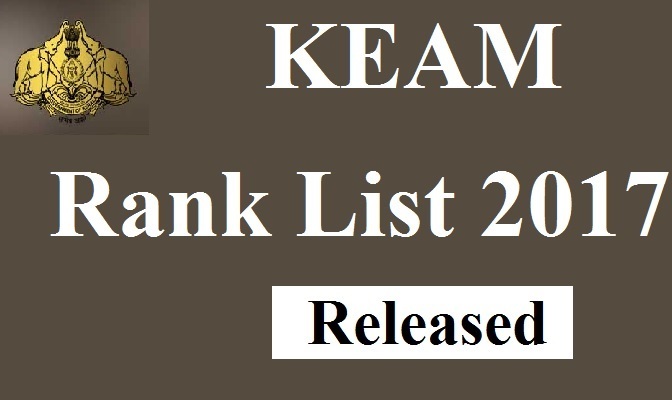 KEAM Rank List 2017 is released by CEE, Kerala. Download KEAM Engineering Rank List 2017 and KEAM 2017 Counselling Dates from official site www.cee-kerala.org. KEAM rank list 2017: Commissioner of Entrance Examinations, Kerala has released the KEAM Rank List 2017 on its official website. It has conducted the Kerala Engineering Agricultural Medical (KEAM) 2017 Entrance Test on 24th and 25th April 2017 and released the Combined Entrance Examination (CEE) results on 18th May 2017. Concerned officials have released the KEAM Engineering rank list 2017 on its official website www.cee-kerala.org. Nearly 90,806 candidates have appeared for Engineering Stream, out of which 72,440 students were qualified.9858 appeared for Pharmacy and 8599 got qualified. CEE, Kerala prepared the KEAM Rank List 2017 by considering the marks scored by the candidates in Engineering Entrance Exam and the marks obtained by the candidate in 12th standard. We have shared an active and direct link of KEAM 2017 Rank List at the bottom of our page. CEE, Kerala has also released KEAM Rank List 2017 for Architecture on its official site www.cee-kerala.org. Architecture Rank List is prepared by considering marks obtained by the candidates in National Aptitude Rest in Architecture (NATA) and marks obtained in the qualifying exam. Candidates are advised to check their ranks, and only those who are shortlisted are eligible for counselling. KEAM 2017 Counselling Dates will be released soon by Commissioner of Entrance Examinations. Kerala Engineering Agricultural Medical in short known as KEAM is a Combined Entrance Examination conducted by CEE, Kerala. Candidates who qualified in KEAM Exam will get admission into various professional Degree courses in the state of Kerala. Check KEAM 2017 rank list from the official website. Follow our website www.Techfactslive.com on Facebook & Twitter to get all the latest updates regarding KEAM Counselling Procedure and Admission. If you have any Problem Contact us at [email protected].